Chapter books for struggling readers offer a little something extra to hook the reader's attention and keep it through the duration of dozens or even hundreds of pages. 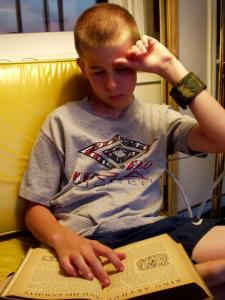 Although some kids are natural bookworms, others aren't nearly as fond of reading. Even though plenty of kids' books are exciting, it takes something special to make a reluctant reader keep turning pages. If you aren't sure what will do the trick, start by talking with a children's librarian, who will likely be able to recommend a few titles that will fit your kids' interests and reading level. Although books of any type have the power to capture a kid's attention, there are a few specific genres that tend to be especially appealing to reluctant readers. Nonfiction - Biographies, books of facts, encyclopedic-type volumes, and other nonfiction books may bore some kids to tears, but they enthrall others. If you have a child who is really interested in a specific topic, such as insects, animals or chemistry, relevant nonfiction titles are ideal. Adventure - Adventure books have nonstop action, which is perfect for kids with short attention spans. There's very little downtime in these books, so it's difficult to lose interest, even if you struggle with some of the material. Humor - Kids love to laugh, and that's part of the reason why joke books will never go out of style. If you want to get your kid a funny book, though, make sure you understand her sense of humor, because something that's absolutely hysterical to one kid may completely baffle another. Sports - Young athletes and kids who love to watch sports on TV are likely to enjoy sports-themed books, too. There aren't quite as many of them as there are other chapter books for struggling readers, so consult a librarian for help in picking out the best titles. Horror - Remember R.L. Stine and his Goosebumps series? A kid who's just a little bit scared by what he's reading is a kid who's likely to keep reading all the way until the end of that book. Graphic novels - Part of the reason why many kids don't do well with chapter books is because the books are not at all visually oriented. A graphic novel is different; it's told through comics and pictures, which can be a lot more interesting to a visual learner. Series books are some of the best choices for struggling readers because they feature the same classic characters in each volume, and kids who like the characters can fly through the entire series at an astonishing pace. The following books aren't all written especially for reluctant readers, but they've proven time and again to be interesting, funny, and exciting enough to hold even the most fidgety kids' attention. Diary of a Wimpy Kid series by Jeff Kinney - Don't like to see a lot of words on the page? No problem. These stories, featuring hilarious middle schooler Greg Heffley, are told partly through personal narrative and partly through comics. Kinney's drawings are simple, expressive, and laugh-out-loud funny. Captain Underpants series by Dav Pilkey - If you have a kid who cracks up at any mention of undergarments or bathroom humor, share these books with her! They're on the short side for chapter books, so they'll likely be quick reads even for the most reluctant readers, and they have plenty of pictures to liven up the text. Chet Gecko series by Bruce Hale - These clever, funny books aren't too long, and the pages easily fly by. The main character, a gumshoe gecko who's in elementary school, is witty and entertaining, so reading the books won't feel like work. Best of all, if your kid turns out to love them, he might be occupied for a while, since there are more than a dozen books in the series as of 2010, and Bruce Hale is still writing. Harry Potter series by J.K. Rowling - Your kid has probably been living under a rock if she hasn't read these yet, but if that's the case, she's in for a treat. The Harry Potter books are absolutely engrossing, as evidenced by the fact that they've captivated millions of kids and adults all over the world. The sheer length of some of the later books can be intimidating to kids who really don't like to read, but chances are that once they hit that point in the series, they'll be so involved that they won't even care. Going through a chapter book can feel like "schoolwork" to many, especially to kids who have trouble staying still or who learn better visually. A lot of text on a page can be intimidating, but fortunately, there are some incredible children's authors working today who have an inherent understanding of what it takes to hook a kid's attention. 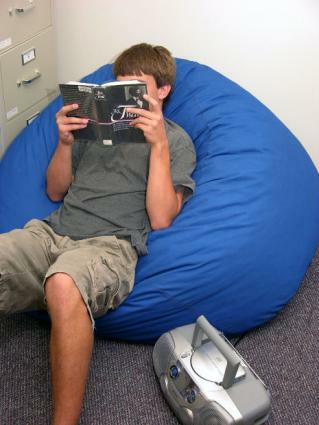 When it comes to books, there is something for everyone, even struggling readers.